The official trailer of Bollywood film Race 3 has been released on Tuesday. The film, a triquel to the super hit Race series stars superstar Salman Khan and Jacqueline Fernandez as the main leads. Directed by the choreographer-turned-director Remo D'Souza, Race 3 has been jointly produced by Ramesh Taurani under Tips Films and Salma Khan under Salman Khan Films. Race 3 also stars Bobby Deol, Anil Kapoor, Daisy Shah and Saqib Saleem. While the action packed trailer of Race 3 has been received well among the Bollywood film audience, it turned out to be a major disappointed for Telugu film lovers. 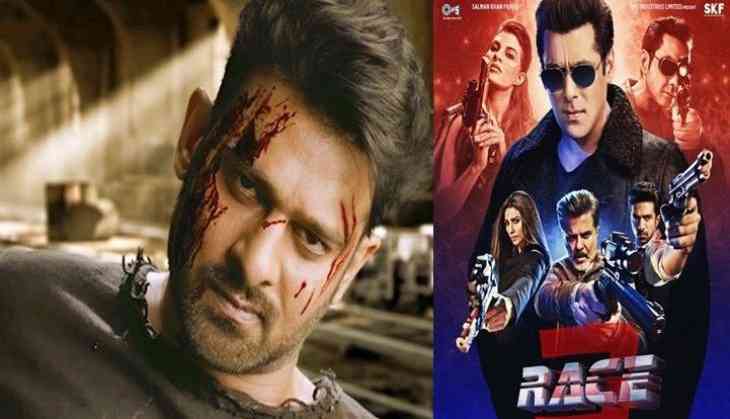 According to Telugu audience, the makers of Race 3 have copied the stunt sequences from the teaser of Baahubali actor Prabhas' upcoming film Saaho. The teaser of Saaho, which had released with Baahubali 2 features a sky-jumper in a fully-body gliding suit jumps from the edge of a skyscraper and cuts the air with style. Similarly in Race 3, the Dabangg Khan is seen wearing a gliding suit in a similar fashion as well. Also, it's known that Saaho is a fantasy adventure and is currently being shot in Abu Dhabi and Dubai. Race 3 trailer also features non stop action sequences filmed in Abu Dhabi. However, the worrying factor for Prabhas fans is that Race 3 is scheduled to hit the screens on Eid while Saaho is expected to release in 2019. Well, this is not the first time Tollywood film lovers are disappointed with the trailer of a Bollywood film. Recently, when the trailer of Baaghi 2 (a remake of Telugu film Kshanam) released, they asked the makers to remake Hollywood film Rambo instead of spoiling their Telugu film.